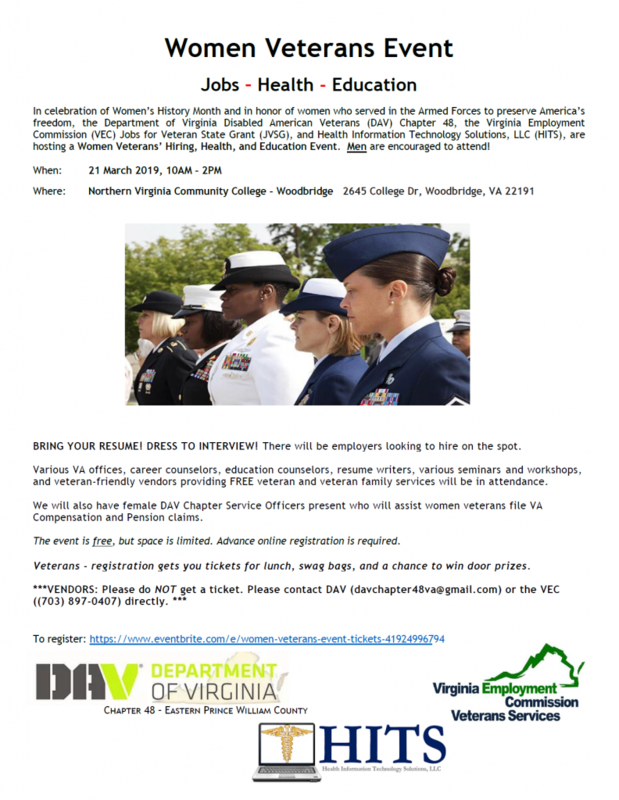 In celebration of Women’s History Month, and in honor of women who served in the Armed Forces to preserve America’s freedom, the Disabled American Veterans’ Department of Virginia Chapter 48, the Virginia Employment Commission’s Jobs for Veteran State Grant, and Health Information Technology Solutions, LLC (HITS) are hosting a Women Veterans’ Hiring, Health, and Education Event. MEN ARE ENCOURAGED TO ATTEND! BRING YOUR RESUME! DRESS TO INTERVIEW! There will be employers looking to hire on the spot. Various VA offices, career counselors, education counselors, resume writers, various seminars/workshops, and veteran-friendly vendors providing FREE veteran and veteran family services will be in attendance. We will also have female DAV Chapter Service Officers present who can assist women veterans file VA Compensation and Pension claims. Veterans – registration gets you tickets for lunch, swag bags, and a chance to win door prizes.